Sabrina Rabin hits the ball. Rabin leads off a powerful Wildcats batting order that will have its hands’ full at the NCAA Regionals this weekend. After a strong regular season and run to the championship game of last weekend’s Big Ten Tournament, Northwestern (36-17, 14-8 Big Ten) already has its most wins in a single season since 2008. With a trip to Georgia for the NCAA Tournament ahead, The Daily’s softball writers convened to recap the Big Ten season and discuss the upcoming postseason. 1. After finishing with losing records each of the last two seasons, what aspects of this Wildcats team led to such a dramatic improvement? Benjamin Rosenberg: NU has been hitting for much more power this season. The Cats hit just 14 home runs in 2017 — this year, they hammered 46. Freshman second baseman Rachel Lewis, with her 17 homers, has more than last year’s entire team. Junior left fielder Morgan Nelson hit just 2 long balls last season and has 13 this year. Every player with enough at-bats to qualify has gone deep at least once. NU’s knack for hitting the ball out of the park has helped the Cats come back several times, most notably April 22 at Rutgers. NU trailed 7-1 in the seventh inning of that game, but hit 4 home runs in the final inning to set the stage for a dramatic comeback win. Three players hit their first career home runs in that inning. Andrew Golden: With their improved offense, the Wildcats have been able to come up with clutch hits consistently with the game on the line this season. In the previous two years, Northwestern was a combined 12-20 in games decided by one run. This year, the Cats are 8-3 in those games. NU’s mentality has changed drastically and their confidence has grown as the season has progressed. The Cats have proven that they are not afraid to play from behind. NU has four Big Ten victories when trailing by at least 2 runs going into the seventh, including two against Big Ten Tournament champion Minnesota. 2. What has made NU’s offense in particular so effective in 2018? Golden: The Wildcats have stuck to their identity all season: getting runners on base and then using their speed to move those runners into scoring position. By being aggressive on the basepaths, the Cats were able to score 324 runs, second in the Big Ten behind Illinois. NU also leads the Big Ten in walks drawn and stolen bases. Rosenberg: It’s the way the lineup is structured. Senior center fielder Sabrina Rabin is an ideal leadoff batter, hitting .379 for the season and leading the Big Ten with 33 stolen bases. If opposing pitchers want to work around Lewis in the second spot in the order, they will have to deal with Nelson hitting behind her. The two sluggers have a combined 30 home runs this year. Senior catcher Sammy Nettling has been driving in a lot of runs from the cleanup spot, too. With senior shortstop Marissa Panko hitting fifth, NU is able to restart its lineup in a way. The Cats have shifted around the bottom half of their order lately, but have another power bat hitting sixth or seventh in freshman pitcher Kenna Wilkey. 3. How do the Cats stack up in their regional field, which also includes No. 7 Georgia, California and Harvard? What are their odds of advancing? Rosenberg: NU actually got a relatively favorable draw. Cal, the Cats’ first opponent, is 34-19 overall but finished just 7-16 in Pac-12 play, against an admittedly tough schedule. The Golden Bears are 2-19 against the RPI top 40, while NU is 7-7 in such games. That said, the road to the Super Regionals goes through Georgia, and the Bulldogs are one of the top teams in the country. The key for the Cats will be their pitching staff’s ability to keep a tough offense in check. 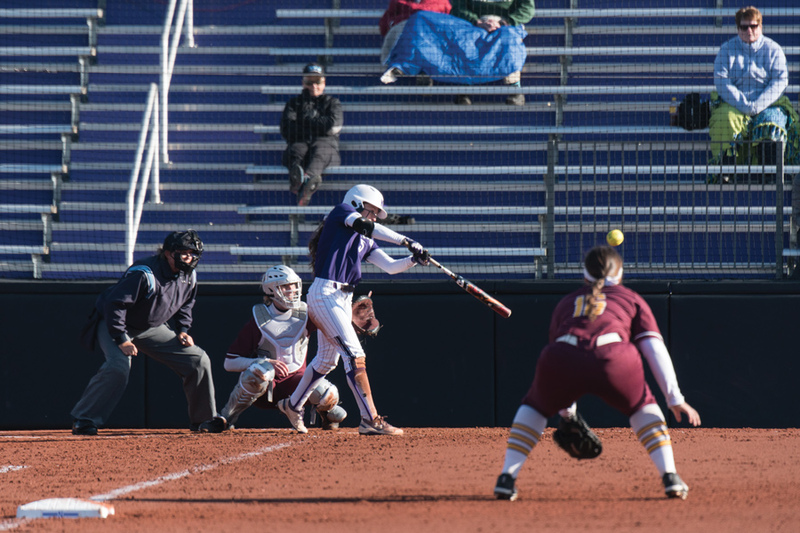 NU relies almost exclusively on two pitchers: Wilkey and sophomore Morgan Newport. The two complement each other well; Wilkey is right-handed and a hard thrower, while Newport is a lefty and more of a finesse pitcher. Georgia ranks third nationally in team batting average, but if Wilkey and Newport can hold their own, the Cats have a chance to move on. Golden: NU matches up pretty well against California and Harvard. In their first matchup on Friday, it will be strength-on-strength. California boasts a 2.45 team ERA, while the Cats’ offense has a .297 batting average. Ultimately, however, the Cats don’t look like they’ll have the firepower to beat Georgia. The Bulldogs have six pitchers with a sub-4.00 ERA, and Georgia’s opponents have an average batting average of .178. The only way the Cats can win is if Wilkey and Newport can limit Georgia’s offense to 1 or 2 runs in each game. I foresee NU getting knocked out of the tournament by Georgia, the same result as in the 2016 Athens Regional.